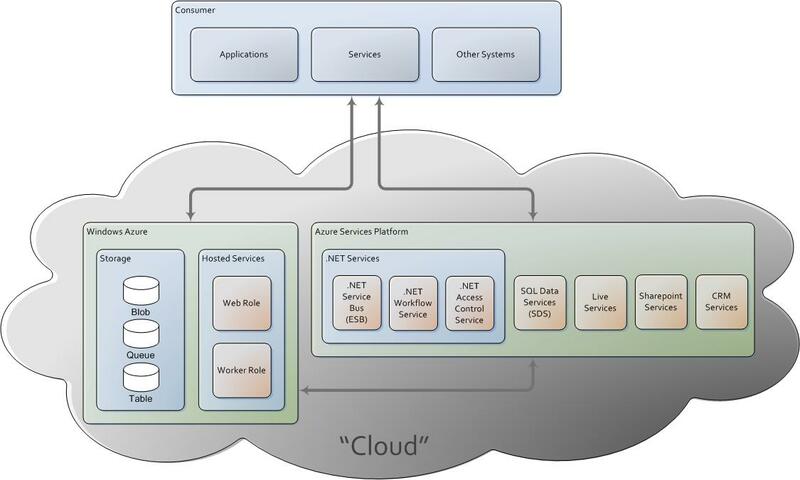 We have all seen the picture below showing the main blocks of the Azure Platform. 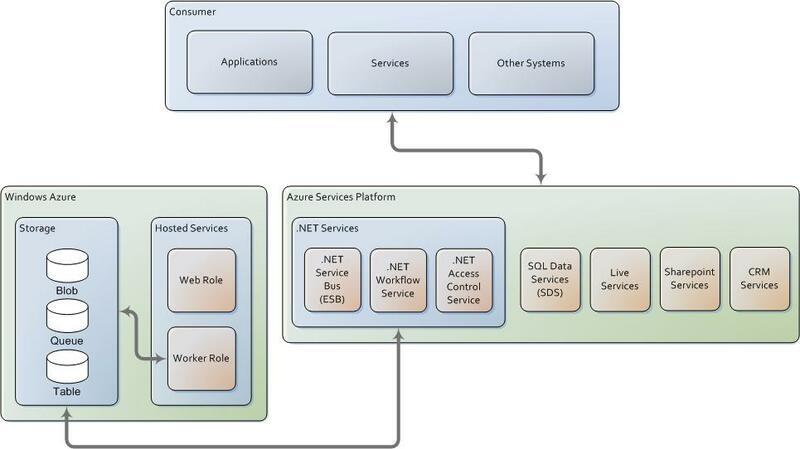 But how, exactly, do all of these services work together to provide us a cloud solution? As I usually say, Microsoft is not extremely good at inventing new things, but is extremely good at turning a particular idea into a great product which really makes sense to use. With Azure, Microsoft took all its great products and frameworks and allowed us to use them on a cloud environment in a way very similar to the one we usually use on our on-premises environment. That´s not quite true; actually, they made it even easier. Usually what we get from a cloud computing solution is an abstraction from the underlying hardware and software where our app is going to run on. Some providers even offer other services such as database management systems, but few go as far as providing content management services, CRM services, mesh services, access control services, SQL reporting and analysis services, a service bus, workflow services, etc. 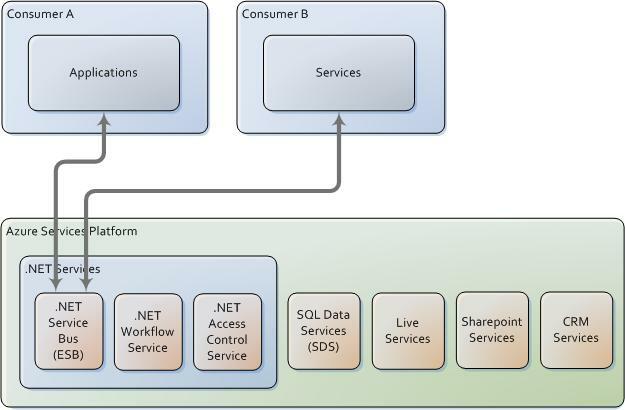 The picture above shows the three main blocks of the Azure Platform, the operating system, the services, and some client portals. Additionally, we get a development environment that allows us to use our favourite programming language. Of course, you will not get an ORACLE database or an Apache Web Server but for the most part you don´t even need to know it is an SQL Server or an IIS under the covers. Zooming in, we get to see the functionalities addressed within each of these main blocks. 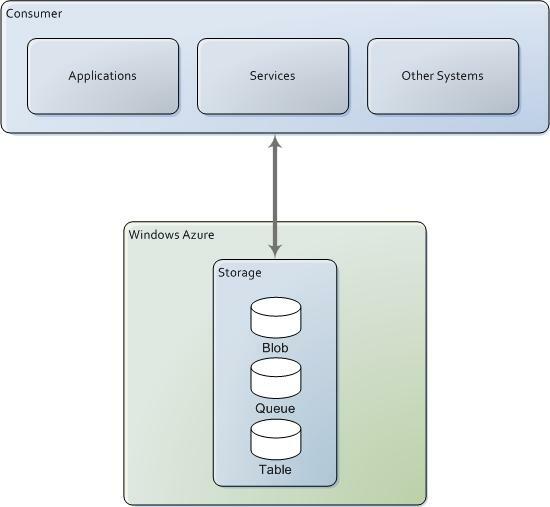 Within the Windows Azure, the operating system for the cloud, we have two main services; management services, also known as Fabric Controller, that takes care of all the virtualization, deployment, scaling, logging, tracing, failure recovery, etc., and the storage system that provide us with a simple way to keep our data in blobs, tables (not SQL tables), and queues. The technologies that we can use to reach all of these functionalities are various, REST, JSON, HTTP, SOAP, etc. To host our apps and services, we have IIS7 and the Framework.NET 3.5 that allows us to expose our services any way we want, through the less standard REST, to the more standard WS*. Whoever is familiar with WCF will naturally take advantage of a new set of bindings that allow your services to be exposed through the new Service Bus on a direct or publisher/subscriber fashion. The services layer provides Live Services, from mesh services that allow you to share and synchronize folders and files, to Identity and Directory Services to manage access to resources and applications. 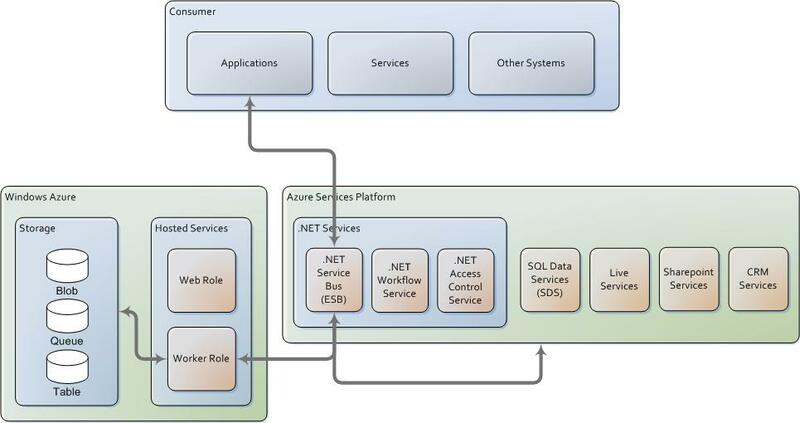 The .NET Services consist of Access Control Services, a Service Bus Service, and a Workflow Service. The Access Control Services , built using the “Geneva” Framework, is basically an STS (Security Token Service) that provides a claims based identity model, along with federation capabilities through WS* standards, that provides authentication and authorization services to anyone trying to access the services layer. The Service Bus, formerly BizTalk Services (I´m glad they changed the name), basically provides publish/subscribe functionality for calling services, as well as location unawareness between the service and the service consumer. The Workflow Service provides service orchestration and integration with the Service Bus and Access Control Service to provide more complex functionalities. It also provides all the functionalities that you can find on Workflow Foundation, like support for long running workflows, workflow designer, etc. The SQL Services provide typical data, reporting and analysis services. We are, now, going to take a quick look at some usage scenarios; how exactly can all of these services and functionalities work together to compose complex applications, processes and services. Some of these I have tried myself and will be posting shortly some practical examples of it. This is a simple use of the Storage environment for applications that require merely a way to keep their data in a persistent store. Microsoft provides Tables, Queues and Blobs, and is working on new ways to store your data, namely File Streams, Locks, and Caches. Tables allow you to store data in a similar way to a DBMS, but, in fact, there is no SQL Server involved. Queues allow you to temporarily store data for processing and are a good way to relay data from one service to another, as we will see. Blobs are more oriented to store unstructured data such as different file formats. 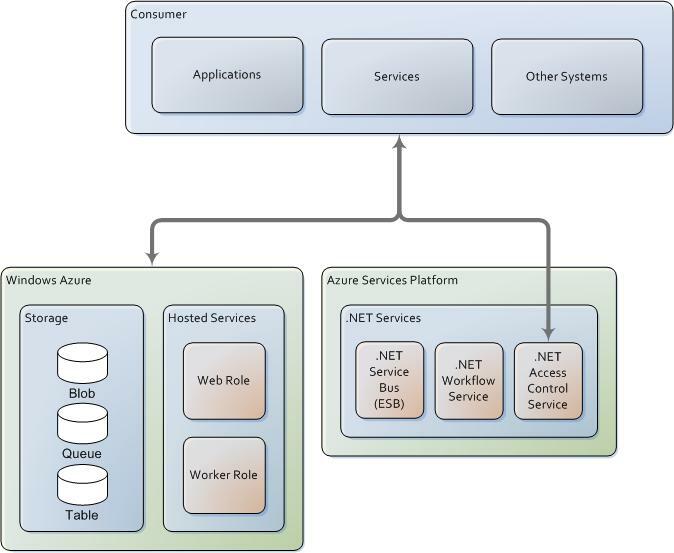 In this scenario, we want to deploy to the cloud an ASP.NET Web Application that possibly uses some storage to keep some of its data. For this, we use the Hosted Services capability, namely, a Web Role to host the Web App. In this example, we are extending the previous example to use a Worker Role to do some background asynchronous processing. A way to relay the data to be processed is to send it through a Queue. The web application posts the data to be processed in the queue and the worker role is periodically checking for data to be processed. 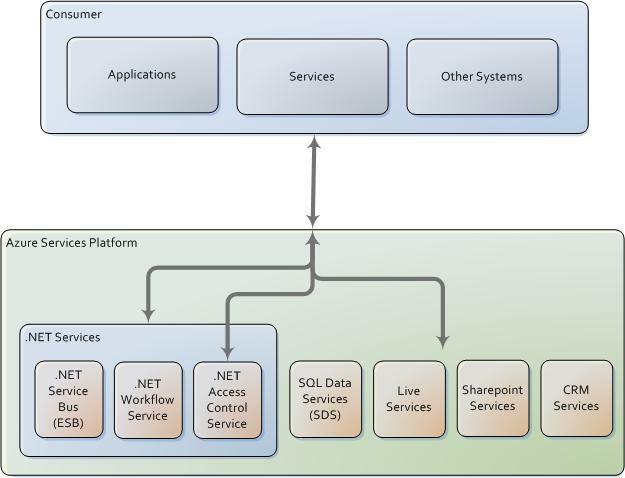 Web Roles are, basically, web applications or services hosted in the IIS. Worker Roles are NT services with a specific interface similar to the SCM (Service Control Manager) that are constantly running and looking for something to do. As explained in the previous scenario, Worker Roles are constantly running, looking for, or waiting for something to do. Worker Roles can access the Storage or call external services through the Service Bus, to collect data, send data, or simply notify an external service of some event. 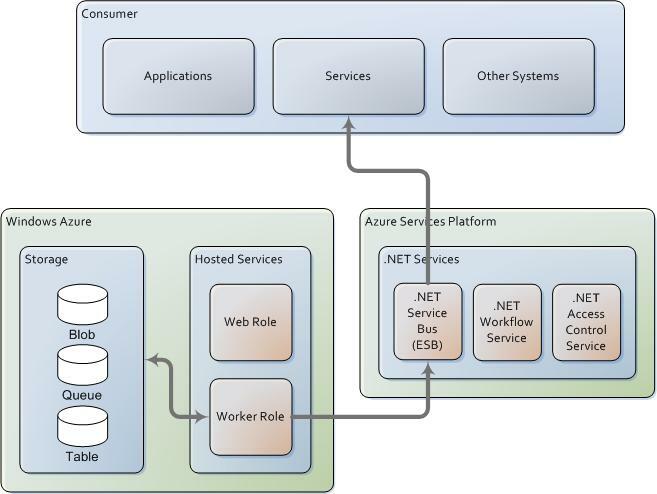 In fact, Worker Roles can call any service within the cloud. 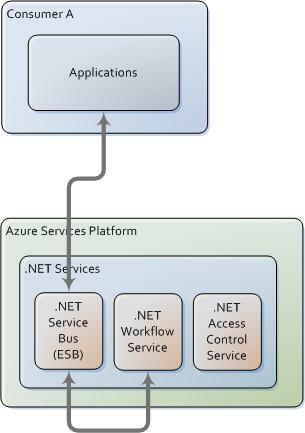 Your applications, services, or any other processes can call into any of the services provided by Azure directly to enrich their functionality. 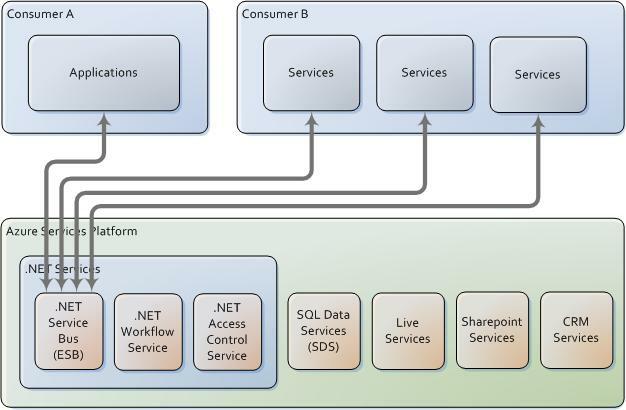 The .NET Services, on their own, can then call other services and/or interact with the Storage system. Through the Storage system we can trigger worker processes to do some asynchronous work for us. The Service Bus is a powerful and useful service that basically acts as mediator between consumers and services. This mediation can be accomplished in two ways; one that allows direct calls from a consumer to a service, another in a publish/subscribe fashion. In both cases, there is no knowledge of the location of the service; the consumer addresses the Service Bus unaware of the service location. This addressing is accomplished through a URL of type sb://servicebus.windows.net/helloservice that both service and consumer use to register themselves on the Service Bus. The service must be registered and active on the Service Bus in order for the call from the consumer to get to it. WCF provides a new set of bindings that allow you to address the Service Bus, BasicHttpRelayBinding, WSHttpRelayBinding, NetTcpRelayBinding, etc. As mentioned, the Service Bus allows a publish/subscriber mechanism for service invocation. This allows one call from a consumer to reach several services that expose the same interface. To work with this configuration, the service contracts should not return values. WCF provides a particular binding for this configuration, NetEventRelayBinding. WCF also provides context bindings, WSHttpRelayContextBinding and NetTcpRelayContextBinding to be used for WCF-WF integration. These bindings allow for WF Receive Activities (Web Services exposed directly from WF workflows) to receive contextual calls, i.e., there is an extra SOAP Header (instanceID) with a reference to the persisted workflow. Those of you familiar with the WF-WCF integration will easily understand the importance of these two bindings. 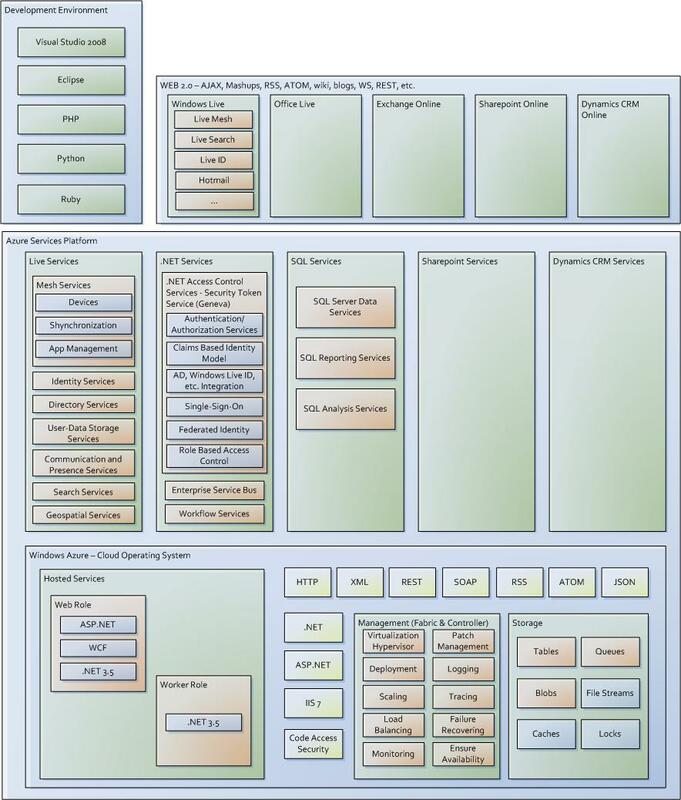 As we have seen the Service Bus can call any other services available in the cloud and outside it. 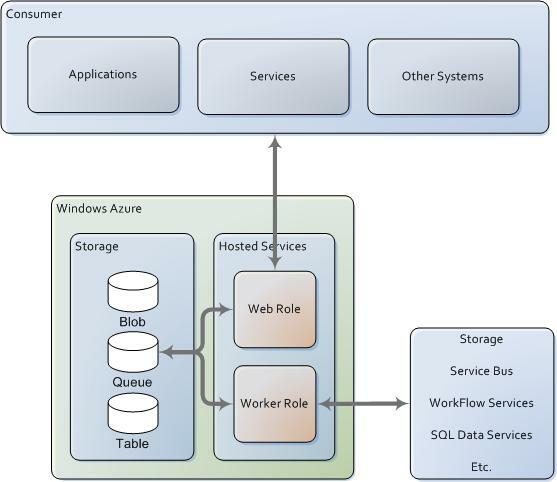 Worker Roles can also implement services and register them on the Service Bus thus allowing external apps to call them. Every call to the services is validated against the Access Control Service. The Access Control Service is actually an STS (Security Token Service) that intercepts all calls authenticating the caller of the service and returning a number of claims used to allow the service to authorize the call. Now, this is a complex topic on its own which I will write about on a later entry in this blog. For now, I just wanted to give an idea on how this service is used. 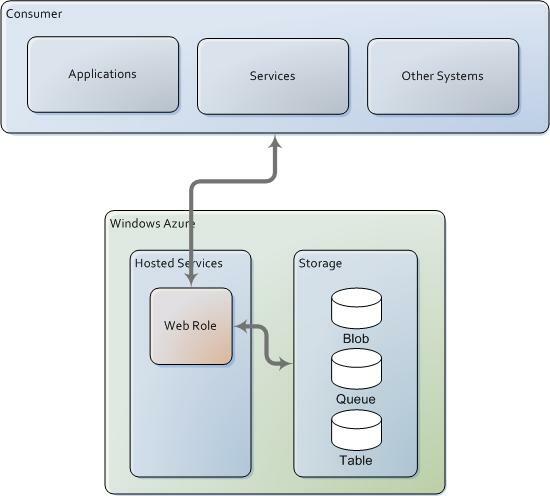 Same thing accessing the web apps in the Web Role hosted services or the storage. There are a number of possibilities, just use your imagination (and some best practices), and you can, basically, mix and match these services according to your needs. You can build complex processes, applications and services using these building blocks without having to worry about setting up the infrastructure that supports it. The benefits are obvious, and I believe that in the long term this is where IT is heading.